Why study our history [specifically American colonization; its impact on our native culture, education, economy, national and global perceptions, etc. ]? We native Filipinos grew up and are still growing up knowing only about: the American innocence. Just like many Americans themselves in their own homeland --thanks to excessive TV-viewing for one, etc.--- are ignorant of the totality of American history. More relevant to us specifically, its distorted narration of the Philippine-American War, usually glossed over under the Spanish-American War aka Splendid Little War , its mock Battle of Manila Bay, Monroe Doctrine, Manifest Destiny, complete Roosevelt Corollary, and the current, if not perpetual drive, for American hegemony in the 21st century. Seldom have American historians given much attention to anti-imperialism in the Philippines or to the scholarship of Filipinos. The Spanish-American War receives dramatic attention; but the bloody so-called Filipino Insurrection (labeled as such to subtly belittle the Filipino revolutionary struggle against Spain, for political independence at the time. Also, many American historians gloss-over American duplicity and intervention which began against Spain in 1896 and lasted until mid-1902 against the United States (1902 -if the guerrilla war Filipinos waged against the American occupational forces to 1913 is ignored). To be sure, the American War against our native revolutionaries was/is an ugly episode in the history of American foreign relations, and until recently American scholars have tended to play down the sordid side of United States history. conditioned to knowingly or unknowingly think and analyze economic and political issues in his own homeland (and abroad) from the American point of view. 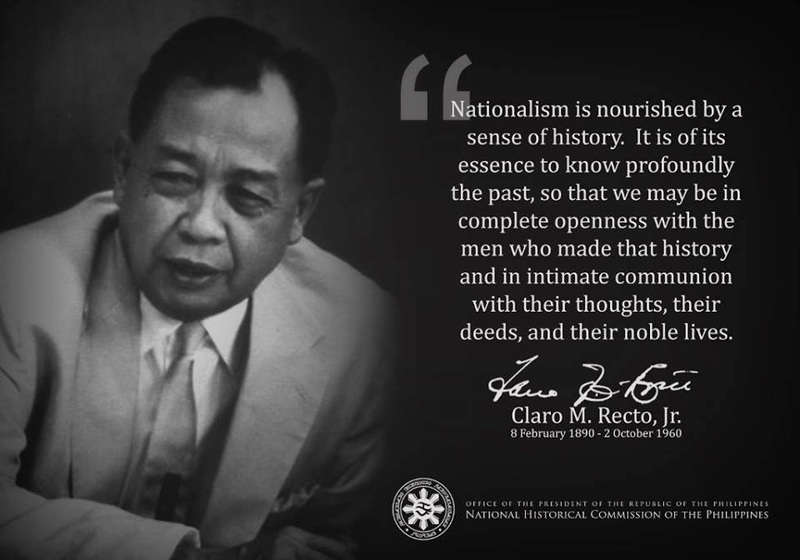 To change this way of thinking, the American drilled into and residing in the Filipino mind need to be removed; for the Filipino to be critically educated, so as to arouse the Filipinism in his heart and mind in matters of national interests (cultural, economic and political); for each native Filipino to ultimately demonstrate and most important, demand from his national leadership honest concern and action for the impoverished native majority (Christian, Muslim, and the forgotten ethnic minorities), to pursue the native common good. The nationalistic outlook is most important and necessary when dealing with all foreigners, such as the American, Australian, Japanese, Korean, Chinese businessmen, their governments and their transnational corporations (TNCs) as they work and exploit our people and homeland indirectly via the IMF and WB and the WTO in the Philippines , ADB, bilateral agreements, etc. among many others [all without the knowledge and understanding of the native majority and rationalized for us so-called educated (schooled) by our subtly quiet but traitorous native technocrats]. Our task in terms of the national economy in our homeland should be to think FILIPINO FIRST, as other nations rightly do think of and for themselves in their own homelands. But of course, our "Filipinism" has to be different from the selfish individualism (lacking in sincere, social concern) of our native politicians, native businessmen and entrepreneurs of the past, who used nationalism to advance solely their own private interests. This latter danger can be prevented by nationalistic mass education; since knowledge and understanding should not be an exclusive domain of the middle class and socioeconomic elite. All these reconstructed Filipino mindset has and is now being perpetuated, knowingly or unknowingly -in the absence of US civilian administrators, Thomasites et al- by our fellow native Filipinos with Americanized minds in our current educational system, media, business, military and other public/private institutions (in addition to the perennial U.S. cultural/media propaganda and official pronouncements). The Americanized Filipino mind requires its "deconstruction" by us native Filipinos who want to be truly Filipino, that is, Filipino nationalists. And be able to overcome/dispose of our still being tribal in thought and action (smacks of regionalism, provincialism, and limits to within the extended family, etc. ), of our past and present tendencies to have "double consciousness:" i.e. the sense of looking at ourselves through the eyes of others, of measuring ourselves by a world that looks on in amused contempt and pity - to borrow a line from one of W.E.B. Du Bois (1868-1963) books, entitled "The Soul of Black Folks." Below "WHAT IS HISTORY?" by A.C. Grayling essay is not directly about our own particular Philippine history but dwells in general about the why and what of history, as a subject matter, is all about. Note especially its last sentence. There is ambiguity in the very name. "History" can mean either past events, or writing about past events. But what if the former is a creation of the latter? The past, after all, has ceased to exist. Here in the present we find documents and other objects which, we suppose, survive from the past, and we weave interpretations round them. These objects, and our interpretations belong to the present. If history is different narratives constructed in the present, is it any wonder that historians disagree among themselves? The idea that the past is another country, spread out 'behind' us, which we could visit if we had a time-machine, is naive. Yet our realism is offended by the claim that the past is created in the present, and we oppose the latitude thus accorded to those who, for example, deny that the Holocaust happened. What, then, is history? Is it an art that creates, or a science that discovers? Either way, is there -can there be- such a thing as historical truth? And if so, to what extent can it be known? "History" derives from the ancient Greek work isotria, meaning inquiry. But even in antiquity the fatal ambiguity arose; by the fourth century BC the historikos -the reciter of stories- had supplanted the historeon -the inquirer. Into which category should we place the great early historians, Herodotus, Thucydides, Polybius, Livy, Sallust, Tacitus? They too understood the problem. Thucydides attacked Herodotus for his expansive and anecdotal history - made up of an artfully arranged collection of anecdotes, facts, legends and speculations - of the great East-West struggle between Persia and Greece. Thucydides began his history of the Peloponnesian War with the claim that history should be "contemporary history," restricting itself to what can be verified by personal observation. he served in the Athenian army, and wrote as he fought. Art outweighed science in most historical writing as far as the Renaissance. But from the 17th century the possibility of scientific history emerged from work on sources. Benedictine monks established principles for authenticating medieval manuscripts, thus inaugurating the systematic treatment of materials. By the time Leopold von Ranke (1795-1886) summoned historians to record the past 'as it actually happened'. the project seemed possible. Other 'Positivists' like von Ranke claimed that there are inductively discover-able historical laws. The great Victorian John Stuart Mill, agreed, adding that psychological laws count among them. On this view history is truly a science: good data and general laws pave the way to objective truth. But the Positivists were opposed by the Idealists, such as Wilhelm Dilthey (1833-1911). Under the influence of Kant and Hegel, the Idealists argued whereas natural science studies phenomena from the outside, social science does so from the inner perspective of human experience. History accordingly is a reconstruction of the past by "intellectual empathy" with our forebears. These ideas constitute the "philosophy of history." They are not works of history, nor of historiography [discussion of historical techniques]. But neither are they works of "philosophical history", exemplified by those grand theories of history's metaphysical significance offered by Hegel, Marx, Spengler, and Toynbee. These latter claim that history manifests patterns, and moves towards an ultimate goal. Positivist history is an attempt to escape the seductions of such a view, by seeking facts. Idealists arguments show that this aim is easier to state than achieve. Work at the coal-face of history is a sweated toil among "primary sources." For ancient times these include such things, among others, as archaeological remains, inscriptions on clay tablets, and later copies of early documents. For more recent centuries the raw materials include royal charters, diaries, property deeds, letters and statistics. Either way a large part of the historian's task is interpretation, which is to say: the act of endowing these silent witnesses with a voice. Without interpretations even documents are mute; until the historian gives them one, they have no meaning. This is why there can be dispute among historians. To repeat the point a different way,: history is not a list of facts; it is a story that we draw from them. And many different stories, all equally good, can be drawn from the same facts. hence disagreement. For this reason historians are not always at the coal-face. An important part of their work involves standing back from primary sources and reflecting on the larger picture they suggest. This is a task of discerning patterns and rhythms, of separating the causes of later developments from the snowstorm of merely adventitious happenings. This kind of historical work requires fine judgment. And it is not only a question of which story best interprets the data, but of what the story itself means. For we wish to understand the spirit of an age to see into its heart and mind, and to acquire a feel for how those who lived in it responded to their world and coped with its dilemmas.